Click the button below to add the Dual Layer Buckleless Belt to your wish list. Two layers of 6-7 oz. bull hide bonded and sewn to create a belt strong enough to carry even the heaviest of firearms. Hook and loop are used to close the belt with a slide-up keeper for extra security. Perfect for the working man or woman who doesn't wear a buckle, but still needs the security of knowing he or she has a solid foundation concealing his/her weapon. 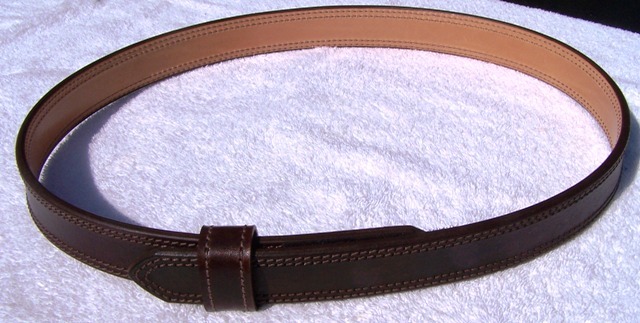 I bought this belt to use as an inner belt underneath my duty belt and it’s been awesome! I had Mike make it very stiff but yet it’s still very comfortable and I have no issues wearing it for 10-12 hours per day. It has no sag or problems supporting my heavy duty belt with all my gear on it. The Velcro used to secure the belt is very heavy duty and holds at whatever tightness I put it at all day without loosening. Mike was very quick to answer all my questions I had prior to ordering and once I placed my order the belt was made and shipped in no time. Extremely happy with the belt!! I have just ordered from Mike,the above mentioned belt.I customised the belt,when i contacted Mike he was very obliging with everything that i requested.What has greatly impressed me so far is the very high standard of their customer service.It is comforting to know that these nice people,place such a lot of emphasis on this.Their web-site also is very customer friendly,easy to navigate your way around.I thank you.